On the surface, the True Value Modified Racing Series event at Lee USA Speedway (NH) had a lot in common with other recent races in that series. 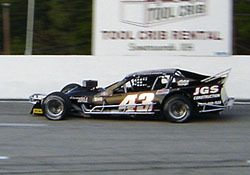 For the third straight event, defending champion Kirk Alexander went to victory lane at the end following the race. Doesn’t sound like much of a story there does it? But this time, Alexander really needed to work for his trophy. He started 22nd, worked his way towards the front in the first half of the race and was then sent to the rear of the field for his role in skirmish that sent Jim Boniface spinning. The incident was even more painful for Boniface. His #71 car was very quick in practice and he won his heat race. He took over the lead on lap 20 and appeared more than capable of winning. However, after the spin his car wasn’t quite the same. He ended up 11th at the finish. Both Kuhn and Mechalides have plenty of laps at Lee, but not in the same type of car that they ran in this race. This was a far cry from earlier in the race. Now with three wins in a row behind him, Alexander credits a few things for his success. The first is a new chassis from Art and Ken Barry’s SPAFCO shops in Connecticut. The other is the guys on his team. After going to the back of the field, Alexander was fired up and even more hungry to win the feature, which is exactly what he managed to do. Alexander's victory also tightened up the point standings. Les Hinkley still leads, but Alexander has now moved up to second after receiving no points in the opening race of the season due to a DQ. Kuhn has also moved into the top ten despite not qualifying for the second event of the season at Monadock. 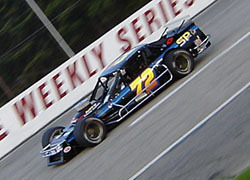 He is currently ranked eighth in the True Value Modified standings. 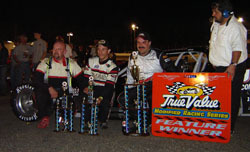 The True Value Modified Series will return to action this Saturday night at the Monadnock Speedway (NH). Meanwhile, a few of the hard luck runners of 2005 managed to turn their fortunes around and finish in the top three at Lee. 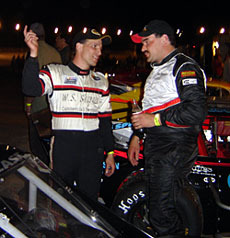 Jimmy Kuhn was second and Louie Mechalides was third. Alexander (R) is joined by Kuhn (M) and Mechalides (L) in victory lane.